Wildfires are the biggest disaster risk San Diegans face regularly, and most are caused by people in some way. 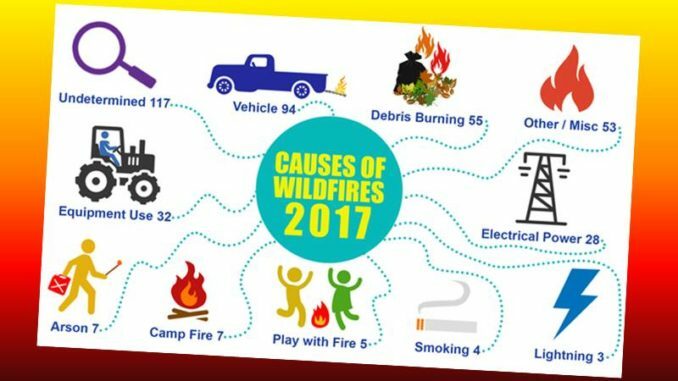 In fact, vehicle-related fires are in the top two causes of wildfires in the County. These fires can be a vehicle engine catching fire because it is poorly maintained, a failing catalytic converter, a flat tire, someone dragging a metal chain, or perhaps pulling over in a brushy area on the side of the road and igniting the dry grass. For example, fire investigators recently announced that the cause of the deadly Carr fire in Redding in northern California was a flat tire on a trailer. When the rim scraped the concrete roadway, it sparked a fire. As the hot weather and dry conditions continue in San Diego, it is important for everyone to be vigilant about fire prevention.